Cabbage Thoran is the heart of Kerala Cuisine. Any Kerala Sadhya is incomplete without Cabbage Thoran. 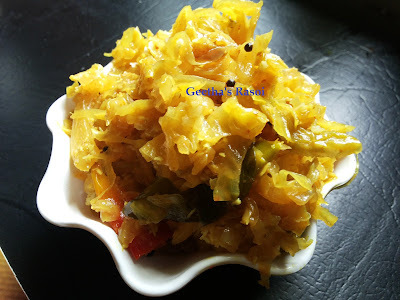 Cabbage Thoran is a stir fry made using cabbage and coconut. In a bowl add finely chopped cabbage, onion, chopped green chilly, turmeric powder, chilly powder, salt, grated coconut and mix well. Keep aside for 5 to 10 minutes. Heat oil in kadai, add mustard seeds and curry leaves when it pops up add cabbage mix, sprinkle little water and close the lid and cook till its done. Cabbage thoran ready to serve.